critical investment and business decisions. We help you to better manage your client’s financial lives. 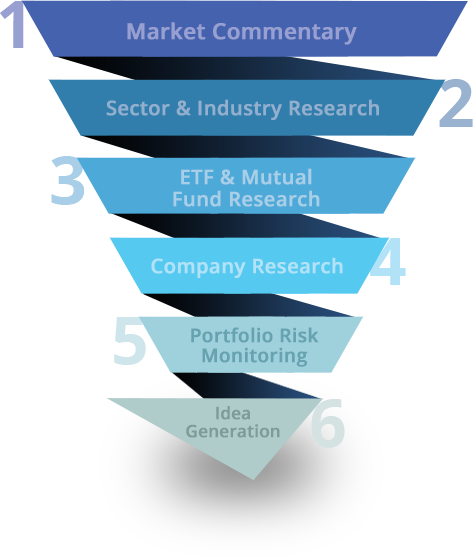 As one of the world’s largest independent research providers with 75 global analysts, CFRA offers a comprehensive view on global sector themes, industries, funds, and companies through in-depth qualitative research on 11 Sectors, 68 Industries,1,800+ ETFs, 22,000+ Mutual Funds, as well as quantitative company research on 12,000+ global companies. CFRA works with wealth managers, financial planners, RIAs, banks, and others to provide independent and indispensable research that helps their clients make the best decisions in achieving their financial goals. 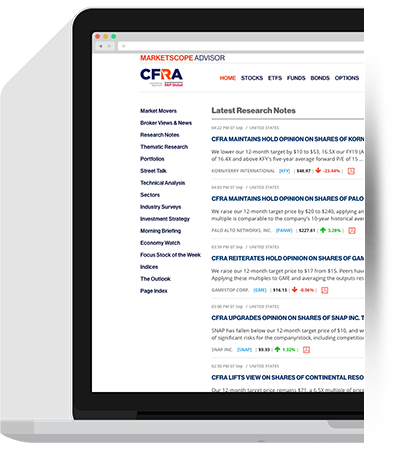 CFRA’s proprietary methodology engine blends forensic and fundamental equity, ETF and mutual fund research approaches to deliver actionable research for improved investment and business decision-making. Weekly market commentary, sector insights and portfolio guidance. Robust analysis covering 11 sectors and 68 industries. Unique holdings-based analysis covering 1,800+ ETFs and mutual funds. Qualitative research of 1,500 global companies; quantitative coverage of 25,000+ global companies. Diagnostic industry and company monitoring for risk assessment. Investigative insights utilizing forensic accounting, legal and exception-based insights.